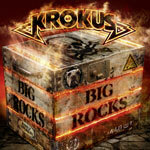 After over 40 years on the scene, with different lineups and incarnations and being on hiatus occasionally, Swiss veterans rockers Krokus, have come to a point where they want to show their audience some of the songs by famous artists that made the band's long journey possible to begin with. Customary regarding cover or tribute albums bands tend to claim some sort of artistic freedom when they interpret songs of their heroes and this record is no exception to that course and that is, I think, the right way to do it, instead of just making an attempt to come out with carbon copies that would arouse interest to no one. The songs on Big Rocks are classic material all the way from start to finish and, if you're not Metallica who are the undisputed champions of turning other bands' songs to kind of their own, it's definitely the safest way to play it if you want people to appreciate what you do. These Krokusified versions have the originality left in a way, but if you're just fairly into what Krokus has done in the past, you can't be mistaken of what band it is that is making these reconstructions. Only one problem, and I might get tarred and feathered for this assertion: I surely am of a different generation than most of the guys in the lineup of Krokus and obviously I don't carry the same relationship to all these songs and I personally think that some of the songs are highly overrated in their originality and actually not any good in the first place. A few of them seem to be popular because the bands were without any massive competition in those days and were being merely groundbreaking and defining the whole style more than anything and therefore gained a position of being great. Apparently my wishes and desires are set on a new album with the band's own songs in lieu of a bunch of cover songs. This record is first and foremost made to please to bandmembers themselves and fans might listen to it for a few times, but since people most likely prefer to listen to original versions this creation will probably be soon forgotten by most people and just a small segment in the band's history when things eventually are about to get summed up.